Apple's event today held in Steve Jobs Theater in Apple Park climaxed to an expected introduction of a updated streaming video service. Apple TV got a couple new features. 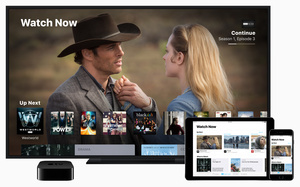 The new Apple TV Channels offers essentially a marketplace and a hub for streaming platforms, and Apple Kids as you'd expect a family-friendly place for content, but the most interesting part of the improved service is the company's own subscription service, Apple TV+. The service was announced with a thundering and epic video segment featuring Hollywood's cream of the crop explaining the process in which they create films and TV shows. This included the likes of Jennifer Aniston, J.J. Abrams, Reese Witherspoon, Sofia Coppola, Ron Howard, Octavia Spencer, M. Night Shyamalan, and Steven Spielberg, who expressed his excitement by promoting the service on stage. It was revealed that the service would become available in over 100 countries this fall, but details about the pricing, release date, or scope of content were not yet shared. What we can expect is that Apple is set to fund original programming by these and other creators with billions of dollars to compete with a modern original programming behemoth Netflix and others. The Apple TV+ will be available alongside Apple TV channels in the updated Apple TV app, which will launch not only for Apple TV but also iOS, Mac, Roku, Fire TV, and popular smart TV platforms from Samsung, Sony, LG, and Vizio.